This forward looking exercise suggests a new approach to better structure Bogota’s fruit, vegetable and tuber supply chain by reviewing and reinforcing certain strategies stated in the Food Supply and Security Master Plan (FSSMP) in order to promote actions by the public sector and the stakeholders involved in this supply chain. Bogota’s fruit, vegetable and tuber supply chain involves multiple actors, business models and interests, which are not yet aligned and can hardly be coordinated without both public and private involvement. In 2003, the City of Bogotá commissioned the CPTCIPEC Consortium to conduct a diagnostic study of the food supply chain system and the nutrition of the city’s inhabitants. This study served as input to the Food Supply and Security Master Plan (FSSMP) in 2006. From a nutritional perspective, it identified significant gaps in the intake of some foods, in particular fruits and vegetables, compared to an ideal diet. Concerning the operation of the supply system, it suggested eliminating massive product loss along the supply chain to increase the offer of these foods and reduce the number of middlemen in food markets as a means of lowering prices and making the products more affordable to the general public. The FSSMP suggested the creation of a new food supply system that facilitates direct exchange among producers and retailers. The new organisation would be bolstered by introducing a virtual trade platform for products, a regional network of food consolidation centres and five logistics platforms in Bogota whose main role would be to facilitate cross-docking operations rather than product storage. Therefore, the FSSMP suggested to undertake efforts to establish groups of producers (supply) and retailers (demand) and advance the design and construction (or implementation) of a logistics and e-commerce platform. Despite all efforts, it has been difficult to convince producers and retailers to shift from traditional supply chains to the new scheme proposed in the FSSMP. New advances in logistics strategy and the first results of implementing the FSSMP show a lack of effectiveness of the strategies originally stated. Therefore, the current study reviewed the initial statements in the FSSMP based on a foresight approach. The foresight methodology used in this study consisted of five stages: pre-foresight, recruiting, generation, action and renewal (Miles, 2002; Popper, 2008b). First, the Master Plan served as input to define the objectives and scope of the exercise. Then, stakeholders and their relationships were identified. Later, system dynamics (SD) was used to model product, information and money flows along the fruit, vegetable and tuber supply chain. The metrics of the SD model, such as flows, costs and prices, were defined from secondary sources such as regional and national studies, statistics, polls and governmental reports. Initially, the FSSMP included only material flows and nine scenarios that focused on identifying capacity problems in production, transport, distribution and inflows to Bogota. However, the new SD model developed in this study went further by including, to some extent, the flow of products, money and information of the five most important products (bananas, oranges, potatoes, plantains and tomatoes) in the fruit, vegetable and tuber supply chain. The actors, represented in boxes, exchange food products. They will send – or ask for – a greater quantity of products through a certain channel depending on supply, demand, prices and costs (Figure 2). Every actor’s purchase and sales prices are determined by adding the previous actor’s costs per unit sold, fixed costs, variable costs, waste costs and expected monthly profit. The cash flows represented are costs of transportation, costs of distribution, costs of selection and prices. 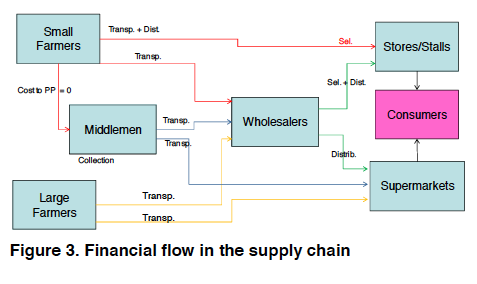 In addition, delays are depicted as money flows from purchases of middlemen, stores, wholesalers and supermarkets, which are paid in cash (Figure 3). Half of the money from wholesalers’ purchases is given at the moment of product delivery while the remaining half is due one month later. Supermarkets apply a 90-days payment policy to their suppliers, which means that total payment is completed three months after receiving the product. We observed an exchange of information among stakeholders before the pricing point (represented by a dotted line in Figure 4). There is an exchange of information about purchase prices with the producers, on the one hand, while sales price information flows to the actors forward in the supply chain, on the other. 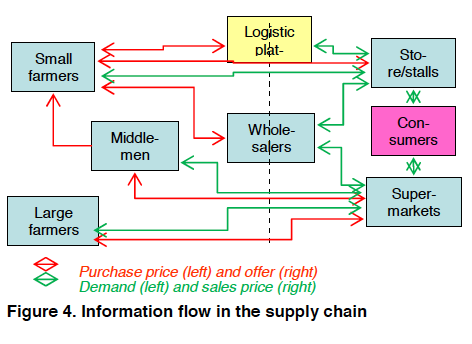 The interaction of actors after price formation produces flows in two senses: information on demand that goes to wholesalers and logistics platforms and information on sales prices that goes to stores and customers. 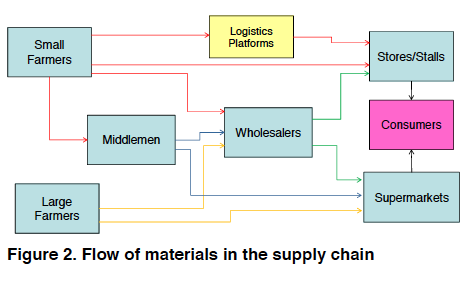 After identifying these three flows that affect the supply chain under study and including them in the new SD model, eleven new scenarios were defined, but only four were elaborated in the SD model. 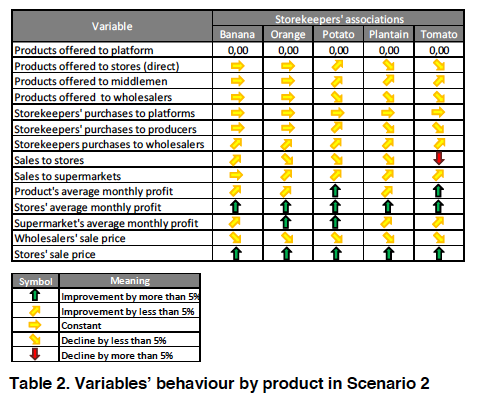 However, in this work we present only two scenarios for the top five products in order to show the impact of storekeepers’ and producers’ associations. 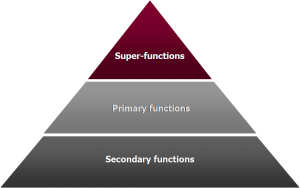 A set of variables in the SD model (tables 1 and 2) was grouped in the following categories: flow changes in distribution channels and variations in product volume, profits and prices. Thus, the model was run to observe the behaviour of these variables for the five selected products. 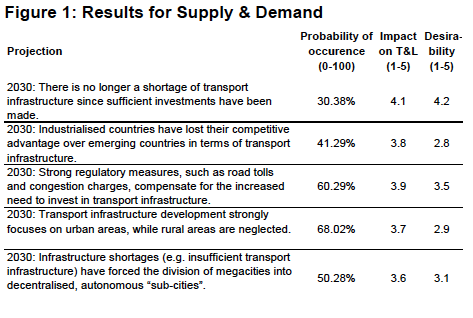 The first scenario measured the impact of producers’ associations on the supply system (Table 1). It revealed a reduction of transportation costs due to better use of transportation capacity, a wider distribution of products’ consolidation costs since they are divided among all producers and an increase in productivity because producers’ orders are centralised. 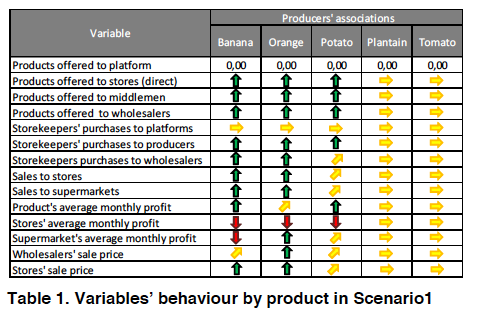 The producers’ association scenario presents favourable results for the various variables along the supply chain for bananas, oranges and potatoes. However, the variables for plantains and tomatoes show no changes, which is explained by the fact that producers of these products generate enough profits to organise transportation to forward actors in the chain on their own. The second scenario measured the impact of storekeepers’ associations on the supply chain (Table 2). In this scenario, there are cost reductions in the selection and distribution of products and reductions in sales prices across all five products sold by storekeepers to customers. The main obstacle to achieving an association of storekeepers is the creation of a scheme for stores that allows an agent to delegate the process of sorting fruits and vegetables to the storekeepers selling the products to the final consumers. 1) The priority for products such as bananas and plantains should be to increase production to supply the city instead of reducing prices. The models reveal that the production of these two foods is quite low compared to demand. Nevertheless, food supply of the city should not be considered isolated from demand in the rest of the country. buying directly from producers and from the size of the purchase order to be managed by the seller in-house. 3) Prices tend to even out between different channels. A balance of prices sets in because producers, looking for higher profits, will attempt to supply the channel that represents the highest profit, increasing the products offered through the respective channel. As a result, we can expect this not only to encourage a reduction in prices in this channel but also to reduce or increase existing shortages of products and costs in the other channels accordingly. 3) to further develop and improve the SD model as a tool to collect and analyse information regarding the food supply system and further pursue the different research initiatives to accomplish the objectives stated in the Food Supply and Security Master Plan (FSSMP). Download EFP Brief No. 233_Reshaping Bogota’s Food Supply and Security Master Plan. Alimenta Bogota Program (2009a): Plan Maestro de Abastecimiento – SDDE. Recuperado el 17 de Febrero de 2011, de Plan Maestro de Abastecimiento – SDDE: http://www.alimentabogota.gov.co/index.php/sobre-alimentabogota/plan-maestro. Miles, I. (2002): Appraisal of Alternative Methods and Procedures for Producing Regional Foresight. Popper, R. (2008b): How are foresight methods selected? Foresight 10 (6): 62-89. We present insights into the design and execution of an international large-scale project on the future of logistics by the year 2025. The basis of our research was an innovative real-time Delphi application. We applied a multi-methodology framework including a real-time Delphi, a futures conference and participatory expert workshops. This allowed for cross-validation and a strong participatory inclusion of policy makers. An example shows how a multi-stakeholder environment can be approached using innovative foresight tools. We illustrate a research case study that aligns foresight activities with a rigorous scientific procedure. We present insights into the design and execution of a large-scale international project on the Future of Logistics 2025 (von der Gracht et al., 2008). We contribute to the foresight community with an innovative and profound research design: First, the research included one of the few and early real-time Delphi applications worldwide (see Gnatzy et al., 2011; Gordon & Pease, 2006) for which a web-based survey software was specifically developed. Second, the research employed a multi-methodology framework, including the real-time Delphi mentioned above, a futures conference and participatory expert workshops. This allowed for significant cross-validation and a strong participatory inclusion of policy makers. Third, it is shown exemplarily how a multi-stakeholder environment can be approached using such tools. Fourth, we illustrate a research case study that aligns foresight activities with a rigorous scientific procedure. The project Future of Logistics 2025 was initiated in the course of CeMAT 2008, the world’s largest in-house logistics fair with approximately 60,000 attendants from 40 countries. This large-scale foresight project was organised with strong support from the German government, several research institutions, industry and Deutsche Messe (Hannover). 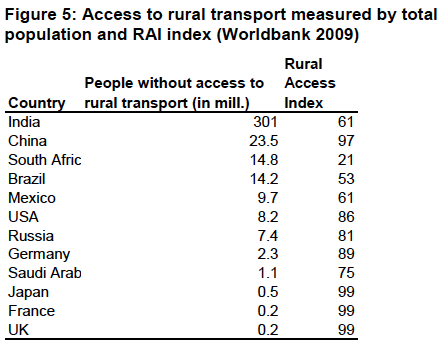 The research particularly focused on the linkage between the transportation and logistics industry and its expected socio-economic contributions in the future in the fields of sustainability, health care and social responsibility among others. The aim of the project was to support companies to best prepare themselves for the future as well as weigh the risks of product innovations and entering new markets. Our approach includes projections of future trends based on extensive conversations amongst and evaluations by experts. 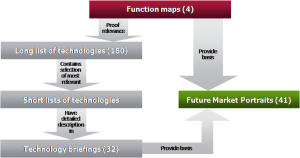 Scenarios for different future options were developed and the consequences for the logistics market described. We aimed to encourage experts from industry, academia and politics to discuss the future of the transportation and logistics markets, of the companies operating therein as well as of the economy in general. We demonstrate that long-term analyses of the logistics environment are highly meaningful since they help companies to orient themselves in complex and dynamic environments and therefore reduce perceived uncertainty. The analyses allow gaining a clearer picture of the future and identifying opportunities and threats. Our global scenario study has illuminated how top-level executives from business, academia and politics see the probable future and what major discontinuities could look like. It provides a sound planning basis for long-term decisions in logistics and mobility, demonstrates the value of scenarios as a management and planning tool, and exemplifies a systematic scenario development and communication process. 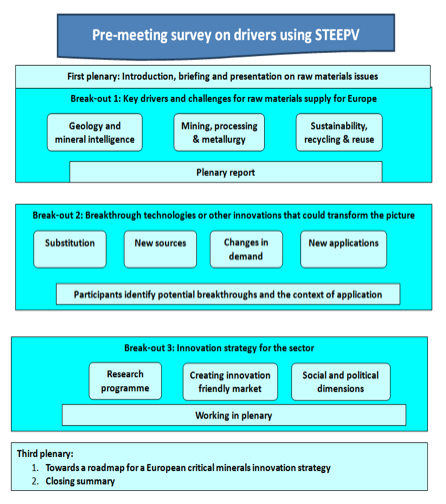 The methodology consisted of several research phases that were interlinked and can be divided into a pre-, main-, and post-conference phase as described in Figure 1. The research initiative lasted for a total of approximately nine months. The pre-phase included the development of the study concept, the programming of the real-time Delphi tool, a software pre-test, the recruitment of an international expert panel and the first part of the real-time Delphi survey itself among 300 internationally renowned experts (Part I). The project was launched in January 2008 when the study was designed and the online portal for the web-based Delphi survey was developed. After a pilot test, the Delphi-Internet portal opened on March 1, 2008. Everyone registered for the Future of Logistics International CeMAT Conference was sent a personal invitation link, giving them exclusive access to the Delphi portal. The experts from business, politics and academia were confronted with 20 projections in the following four subject areas: (1) economic developments, (2) political challenges, (3) socio-cultural trends and (4) technological innovations. The survey was conducted online with the help of a web-based application, which makes real-time evaluation possible. The participants were asked to assess the projections in terms of their expected probability, impact on the global economy and desirability using the ratings scale provided. They were also given the opportunity to justify their responses by providing comments. The interim results of the survey were presented at the Future of Logistics Conference as part of the CeMAT trade fair in May 2008. Therefore, the main-conference phase with 216 attendants comprised an initial trend briefing with the Delphi survey results and their joint reflection in presentations and moderated rounds of discussions (2+1 keynotes), open discussions as well as discussions in small groups, “coffee worlds”, which is an innovative form of participatory workshop. The post-conference phase, in turn, included a follow-up real-time Delphi (Part II). The online tool was available to the participants until the end of June 2008 so that they could modify their responses. Once the portal was closed, the final analysis and aggregation of all data, scenario development, discontinuity analysis and dissemination were conducted. Possible global future scenarios were drawn based on the Delphi data collected from the experts questioned. Conceivable opportunities and surprises were sketched out in detail. The opportunities represented future scenarios that can be actively shaped. We included extreme scenarios and wildcard scenarios in our analysis. Two projections (“Energy Sources” and “Global Water Crisis”) were selected for the former, both of which display a very high probability and impact. Four scenarios were developed out of these two projections (scenario axes), each of which describes a world that could come about. Furthermore, the wildcard scenarios described single events or developments that may seem improbable from today’s standpoint but ultimately cannot be ruled out. It is not about the probability of such events but the potential impact that they or similar occurrences could have. They could be the result of technological breakthroughs, social tension or political overthrows. Our methodological design proves to be a profound foresight approach to research a complex and dynamic environment, such as the international transportation and logistics industry. The different research formats, several linkages and cross-validations as well as intense participatory reflections with policy makers enhanced the scope of the content and its penetration. Especially, the use of innovative approaches, such as the real-time Delphi and coffee worlds, stimulated the discourse significantly. The real-time Delphi alone generated 826 comments on 20 future projections, which were assessed by 65 participants. Overall, the situation in 16 countries from all continents was considered in the scenarios. Moreover, the web-based, real-time Delphi study was able to significantly streamline the process since all group opinion calculations were provided in real-time during the survey. Our contribution to the FTA debate is thus a methodological one by integrating multiple methodologies and designing and applying a real-time Delphi in a multi-stakeholder environment. An analysis of the responses produced three clusters, each of which must be viewed very differently: (1) potential surprises (low-probability, high-impact cluster), (2) eventualities (medium-probability, high-impact cluster), and (3) expectations (high-probability, high-impact cluster). First, potential surprises are often neglected by companies because they are considered improbable, but they have a moderate to high impact if they do occur. The projections in this cluster all involve some kind of revolution – be it an educational revolution in developing countries, a health revolution brought about by global business coalitions, technical revolutions due to automation and digitisation or even terrorist attacks. Second, the occurrence of high-impact eventualities is not considered to be very likely, but they involve serious impacts. When they become the object of debate, a wide range of very controversial opinions usually emerges. In this study, the projections grouped under this cluster can be combined under the heading of “competition”. They revolve around the best access to resources, protectionism between spheres of interests and competing megacities. Finally, high-impact expectations are characterised by a high expected probability and high impact. They are of huge strategic importance to companies. Projections in this cluster included the availability of resources on all levels, from trained staff to energy and water. The respondents believe that the formation of industrial clusters and technical innovations will offer solutions to these urgent problems. If we analyse the driving forces in the market environment and the developments we can expect to see on the market, we find opportunities in the form of possible ways for the logistics sector to innovate and invest in business development. These opportunities present future scenarios that can be actively shaped. Developing these opportunities broadens companies’ horizons for what may happen in the future in terms of products and services, strategies, processes and solutions. We analysed a selection of the most promising opportunities arising from the Future of Logistics Conference 2008. These are business areas that are either brand new and may at first seem rather unusual, on the one hand, or simply represent possible extensions of existing business areas, on the other. The course we take to equip ourselves for the future can be set today by developing such opportunities. Each company must decide individually which of these opportunities to pursue. The formulation of opportunities is a very creative process. 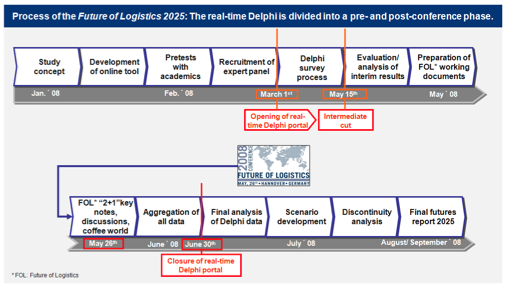 Based on the results of the real-time Delphi and the material discussed at the Future of Logistics Conference 2008, 120 possible courses of action were identified for logistics in several creative workshops. Numerous areas were covered, including products and services, cooperations and networks, controlling and finance, people and culture, marketing and public relations. Unlike many scenario studies, we also included discontinuities, which can take the form of surprising events or developments, such as natural disasters, innovations and their consequences, or societal changes. The financial crisis 2008/2009 can be classified as such a discontinuity. By excluding discontinuities, scenario planners run the risk of missing major additional opportunities. By including discontinuities, companies can identify further alternatives and increase their ability to adapt to surprises. They help to broaden the perspective and to test the robustness of strategies and decisions. There are two common ways for companies to systematically consider discontinuities: extreme scenarios and wildcard scenarios. Both approaches have been included in the Future of Logistics project. Discontinuities have been considered based on the results of the Delphi and the debates at the conference. Scenario axes are a widely recognised tool for constructing extreme scenarios in a coherent and systematic way. According to this instrument, scenario planners select two driving forces or key factors that are considered to be of particular interest for scenario considerations. These factors are then plotted on two axes, resulting in four different scenario quadrants. 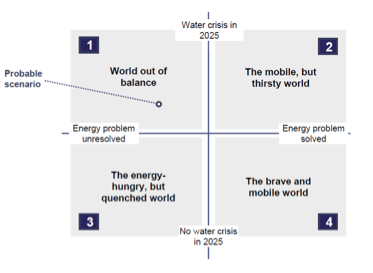 In the scope of this study, the projection about energy sources and a global water crisis were selected due to their high probability and impact rating as well as their topicality and momentousness – an assessment shared by many conference participants (Figure 2). The scenario writing process, i.e. the definition of scenario premises and the description of the scenarios, was supported by extensive desk research. Wildcard scenarios describe single events or developments that may seem improbable from today’s standpoint but ultimately cannot be ruled out. The wildcards outlined in this study involved the fabbing society, terrorist attacks, the spread of a pandemic, and space logistics. For example, the disruption of logistical networks could have detrimental effects on the economy of a country. Such networks are therefore an attractive target for terrorists. Attacks on political, ideological or religious targets are possible at different points. Important hubs, such as seaports and airports, could be disabled by physical aggression. The same applies to bridges or tunnels that span narrow passages between geographical boundaries. Attacks on these targets could bring traffic to a complete standstill or greatly hinder transportation along the route affected. In our research, we aimed at closing a research gap with respect to future developments in the transportation and logistics industry. More specifically, two research questions guided our research: (1) How will the macro environment (political/legal, economic, socio-cultural and technological structure) of the logistics services industry change by 2025? 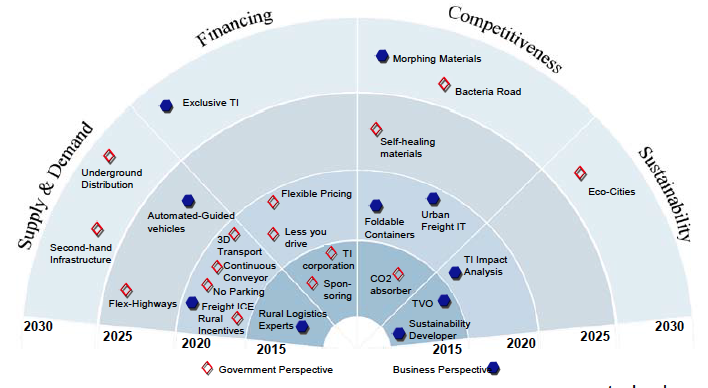 (2) How will the micro environment (industrial structure) of the logistics services industry change by 2025? Based on empirical research, we examined possible events and developments, identified major factors and aggregated expert knowledge on the long-term future. We developed and applied a novel real-time Delphi application. We discussed the results in participatory workshops and a conference with experts from politics, academia and industry. We derived scenarios as well as recommendations for managers and governments. Future foresight exercises should include an even broader range of participants. The real-time Delphi tool could be used to further encourage the discussion and dissemination process including application during the conference and participatory workshop sessions. The research, and especially scenario development, is mainly based on qualitative research, even though we provide statistical data to support our qualitative findings. Further quantitative data (e.g., with respect to cost implications and industry growth rates) may be included in the analyses to provide a more tangible basis for strategic planning. The overall feedback of the participants in the research process was very positive. The experts welcomed the opportunity to share opinions and insights with the expert group assembled for this purpose and encouraged us to proceed with the approach. This led us to publish a study in 2008 to present the foresight process and its results to a broader public. von der Gracht, H. A., Darkow, I.-L., Walter, S., Jahns, C. & Thomsen, E. (2008): Future of Logistics 2025: Global Scenarios. BrainNet Science Edition, St. Gallen. Gnatzy, T., Warth, J. & von der Gracht, H. A. (2011): Validating an Innovative Real-Time Delphi Approach – A methodological comparison between real-time and conventional Delphi studies. In: Technological Forecasting & Social Change, corrected proof, in press. Gordon, T. & Pease, A. (2006): RT Delphi: an efﬁcient, “round-less” almost real time Delphi method. In: Technological Forecasting & Social Change 73, 321–333. The Innovation Futures (INFU) project deals with the emergence of new innovation patterns, such as open innovation, user innovation, community innovation, social innovation and design innovation. Based on a foresight exercise, the project examines different patterns of how innovation is organised and studies implications for business and policy making. For the first time, a foresight project is conducted for analysing and discussing systematically the emergence and diffusion of new innovation patterns and their implications for European policy. There a number of indications that the way economic actors interact in order to transform knowledge into new products and services is currently undergoing substantial changes. The emergence of new innovation patterns with new actors, different roles and new modes of interaction implies re-configurations in European innovation systems with far reaching implications for European S&T in the long run. While a few radical visions have been taking up these signals and are predicting disruptive change for economy and society there is little systematic exploration of possible future innovation landscapes and their implications for economy and society. However, in order for research and other policies to be prepared for challenges arising from these changes and to be able to benefit from them, a more solid understanding of possible innovation futures and their implications for society is needed. At the same time there is a need for debate among innovation actors creating awareness, shared visions and momentum for change. people’s attitudes towards innovation activities and their dependence on cultural context (e.g. Innovation fatigue and passive consumer mentality versus individualisation and experience economy). initiation of an interdisciplinary, boundary-spanning stakeholder and expert debate on new innovation patterns. The project combines various foresight methods and builds on the existing academic literature on new innovation patterns. The INFU dialogue starts by identifying emerging signals of change in current innovation patterns and then progresses by increasingly integrating diverse perspectives and knowledge sources towards consolidated innovation futures scripts. 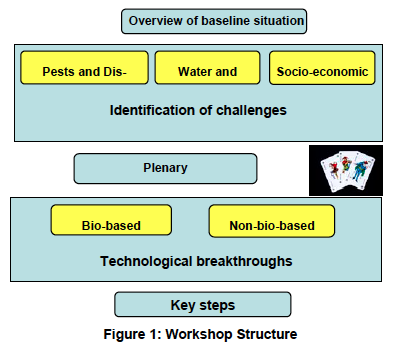 These bottom-up visions are then confronted with different possible socio-economic framework conditions and global mega-trends to finally synthesize consistent scenarios which integrate micro, meso and macro elements of possible innovation futures with particular emphasis on changes in the nature and content of research. Finally, policy strategy options are developed to prepare for the identified changes in innovation patterns. In the different stages a wide range of experts and stakeholders are involved, e.g. within panel discussions, interviews, scenario workshops and online-debates. Based on an analysis of various sources such as the academic literature, internet, newspapers and magazines signals for arising innovation patterns have been identified in the first year of the project. In total, 63 ‘signals of change’ were identified and structured information was collected for every signal of change. In our context, a weak signal indicates a change in an innovation pattern with a potential of disruptive impact, which is not established as a common way of doing innovation (in a sector). The identified examples and cases often combine existing ideas, concepts and strategies (which are also described in the academic literature) in innovative ways, show new applications and thus expand our thinking about possible innovation futures. Describing “new innovation patterns” requires a definition or at least an understanding of what is new. With “new innovation patterns” we mean novel emerging concepts, ideas and strategies of how innovation is organised, but also well-known trends such as open source software development, which are already of importance in specific industries or areas, but may have a larger impact or potential for other areas in the future. In this sense, specific concepts and strategies may be “new” for specific industries. The set of identified weak signals served as base for the development of 20 innovation visions, which, in a creative way, amplify and combine some signals in order to develop coherent, plausible and sometimes provocative pictures of possible future forms of innovation. Thereby the team transferred an idea already applied to other sectors or generalised a signal considered to become a mainstream practice The visions have also been visualized by a video which can be seen on the project web page: www.innovation-futures.org. In the next stage of the INFU project the various impacts, likelihood, opportunities and threats of selected innovation futures will be discussed and elaborated in more detail. This innovation vision assumes that open source development is no longer limited to software development but becomes an all compassing innovation pattern. Many products and services are provided by people contributing bits and pieces to various technological and social innovation projects. Open source business models and coordination mechanisms abound. What are possible socio-economic impacts? Competition on the market could slowly be replaced by ‘strategic co-opetition’ between companies. The critical question of a balanced ‘co-opetition’ is to regulate that a certain level of competitiveness ensures constructive improvement between monopolistic inertia and market competition. In the long term, we may also see a stagnation of innovation activities within firms as everyone is waiting for the others to move, hence, companies might more evolve towards closed innovation, and open source may finally stimulate also closed innovation. From a social perspective, the democratisation of product knowledge might give benefit to poorer societal groups and societies, and the increase of ‘copy and paste’ might lead to less safe products and thus higher societal costs. Imagine that innovation camps, where people gather for a few days to innovate together, become widely established as a means of problem solving. Innovation camps are used by companies, the public sector and civil society to solve problems ranging from high-tech challenges to innovative neighbourhood facilities. Certain groups of people regularly join innovation camps. What are possible socio-economic effects? Innovation camps are an established format to collect ideas of young talented people. They are systematically integrated in the education system as a new means to foster innovation culture and to increase interest in science and research in order to meet the demand from knowledge-based industry. The participation is organised as a reward for young people that have participating in contests before. The camps also give way to future perspectives and personal development (careers, grants, jobs, education, etc.) chances. What if companies no longer innovated themselves but fully externalised innovation to an open innovation marketplace? Nomadic innovators bid on innovation tenders and contests in constantly changing teams. They gather in co-working spaces some of which are top-favourite employers for creative people. What are possible socio-economic impacts? Companies may be able to draw on a much broader range of ideas and perspectives. They can manage their innovation processes more flexibly and efficiently. Co-working spaces provide an interesting alternative to nomadic isolated worklives of self-employed knowledge workers. They may also become seeds of social entrepreneurship and help integrate marginalised groups. This innovation vision can be sketched by asking the following question: What if the bulk of successful and disruptive innovations came from today’s emerging markets? Thus, in this vision, the West adopts the role of a follower and has to face products primarily designed for a different cultural context. Western companies wishfully look to Asia, often with the help of industrial espionage. Creative people migrate to the new innovation hot spots in Asia and send back their money home to the US and Europe. What are possible socio-economic impacts? Western companies would lose market shares and significance in international markets. There is a need for restructuring of Western markets: economies focus on local needs and local products with a high quality standard and no longer on front running products. The current tendencies of “globalisation of wisdom”, and “technological convergence” would be limited by specialised regional innovation clusters. In addition, Western Nations would lose wealth while people in the Middle East and Asia would benefit. Social welfare systems in the West would no longer be fundable due to tax losses and a rise of “unproductive” shares of people in society (ageing population and unemployment). The migration of highly educated people as well as industrial workers to new markets would increase. European societies would age even more rapidly than projected. Thus, social tensions and crime could increase, as the West suffers economically. What if the current emphasis on innovation and creativity among designers, programmers and engineers spread to all workplaces? Hence, all employees, from the janitor to top management are constantly involved in innovation activities. Creativity is part of any daily job routine and is a key in performance measurements. If more and more people suffer from the constant innovation pressure, innovation could become something undesirable and negative. Increasingly, people may feel compelled to use their spare time to meet the innovation demands – which could have negative effects on people’s health. Creativity drugs could become common and a loss of orientation due to the continuous change might be a consequence. Designers and engineers may feel threatened by the distributed innovation approach. At the same time, a counter trend may be that innovation fatigue takes over and “No-Innovation” is en-vogue in certain areas. Thus, managing that we end up with a “balanced innovation culture” is a challenge in this scenario context. Think about the following: What if the principle of “Waste equals Food” (cradle-to-cradle) was widely adopted? 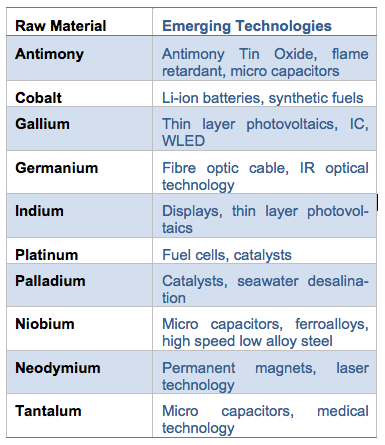 Raw material databases with used components and materials serve as a starting point for innovations. The whole world becomes one eternal circle. Everything that is made of something is part of making something. A change towards waste-based innovation would lead to a highly environmentally friendly economy. However, if recycling makes sense depends on the specific product, as in some cases recycling or reuse may have higher environmental costs. Some products might have to be banned entirely. Waste-based innovation would probably lead to a radicalisation of material awareness and could open the door for the advancement of recycling technologies and production. Trading of waste would become an even more highly profitable business. In 2009, the city of Munich launched an idea contest to animate as many people as possible to generate and advance innovation concepts on energy efficiency in the fields of mobility and habitation. We could ask: What if cities became stronger actors in the field of innovation by proactively pushing for needed and demanded solutions? Cities could take on the investment risks for the development and implementation of needed innovations and use these as a new economic factor by patenting and marketing their solutions to other cities. Possible impacts: City-driven innovation initiatives could increase the probability for people to find solutions for social and environmental problems which are beneficial for all. They could also lead to ideas which otherwise would have never been realised by private actors. At the same time, as a public customer, they can also open new market opportunities for suppliers and therefore help to reduce market risks. The innovation visions presented span a wide field of possible innovation patterns, and, as briefly illustrated, lead to various effects in the social, economic and environmental dimension. An analysis of the innovation patterns reveals that a significant driver in the economic dimension is the increasing global competition. The pressure to innovate is rising due to ever-shorter product life cycles, growing product piracy, and the transition of industrialised societies into knowledge economies. The key question is: How can we develop better ideas, implement them faster and spend less money while doing so? Another economic driver of changing innovation patterns are changes in the work world: Flexible working patterns, outsourcing and the increasing number of professional freelancers foster and enable the emergence of new innovation concepts. Moreover, companies have started to realize the direct (money) and indirect (reputation) economic value of social and environmental innovations, so there is a growing interest in both of these areas. Geographical changes in innovation patterns, in particular the shift of innovativeness to developing countries, is driven by cost advantages and the rapid economic catch-up in those countries. In the social dimension, many innovation futures are driven by people’s growing ability and willingness to deal with social media and collaboration tools. This driver is closely connected to the repeatedly mentioned aspect that the younger generation is about to enter the business world, bringing with them new ways of thinking about (free) knowledge sharing, collaborating and inventing. Another trend is the spread of individualisation, which, as one effect among others, increases people’s ambitions to express themselves by influencing the design of products and / or to change the functionality of solutions and services according to their individual needs. Finally, there is also evidence that there is a change in the way innovators and being innovative is regarded socially: Being innovative is becoming more and more socially desirable for a growing number of people. From an environmental point of view, the growing awareness of climate change, social grievances and the inefficient use of resources are driving forces for emerging innovation patterns. However, new innovation concepts could fail for precisely these reasons if they turn out to be resource-inefficient or to produce tons of new waste. From a technological perspective, especially new Web 2.0 applications are bringing about changes in innovation patterns, as they make knowledge sharing and collaborating easier and more affordable, also on a global scale. Furthermore, many new innovation concepts are expected to result from the upcoming technology wave (sustainability technology), and general technological progress, i.e. cheaper, more powerful and usable devices. In the final stage of the INFU project, the various impacts, likelihood, opportunities and threats of selected innovation futures will be discussed and policy implications will be elaborated in more detail. De Jong, J., Vanhaverbeke, W., Kalvet, T., Chesbrough, H. (2008): Policies for Open Innovation: Theory, Framework and Cases, Research project funded by VISION Era-Net, Helsinki. Stamm, B. von, Trifilova, A. (2009) (Eds. ): The Future of Innovation, Gower, Surrey.